“The story is told in a way that helps younger children connect to the feelings of sadness and fear of the refugee experience. 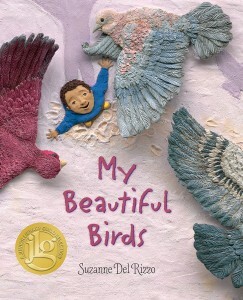 Pajama Press is proud to announce that My Beautiful Birds by award-winning author-illustrator Suzanne Del Rizzo is a 2017 Quill & Quire Books of the Year selection. Quill & Quire “is the magazine of the Canadian book trade….The magazine reviews around 400 new titles each year, offering the most comprehensive look at Canadian-authored books in the country.” Learn more here. Pajama Press extends our congratulations to Suzanne Del Rizzo, and our sincerest thanks go to Quill & Quire for their commitment to championing and promoting Canadian publishing. 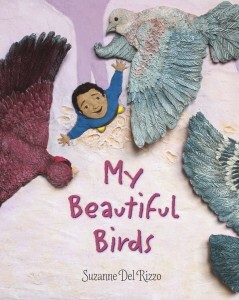 Other notable acclaim for My Beautiful Birds includes winning the 2017 Malka Penn Award for Human Rights in Children’s Literature, honor book selection for the 2017 Middle Eat Book Award, a New York Times Notable Books selection, a 2017 OneBook for Kids, One San Diego selection, a Junior Library Guild selection, and nomination for the 2017 Cybils Award for Fiction. My Beautiful Birds is also a NECBA Windows & Mirrors Fall 2017 selection, and a selection among Betsy Bird’s “2017 Books I’m Really Looking Forward To”. “…When you live in a peaceful place where there is no war or conflict, it is hard to imagine what it is like to lose everything. It is hard to imagine what it is like to be a refugee. Unfortunately, today more people have been displaced by conflict and natural disasters than ever before. One of the places where these displacements are taking place is Syria, a country that has been ripped apart by war. In this story we meet a Syrian child whose whole life is turned upside down when his hometown is destroyed. We watch as he struggles to adjust to his new existence in a refugee camp, and as he longs for what he used to have. Beautifully written, and illustrated using polymer clay and acrylic, this picture book serves as a tribute to all those families who have had to venture out into the unknown when their homes have been taken from them.